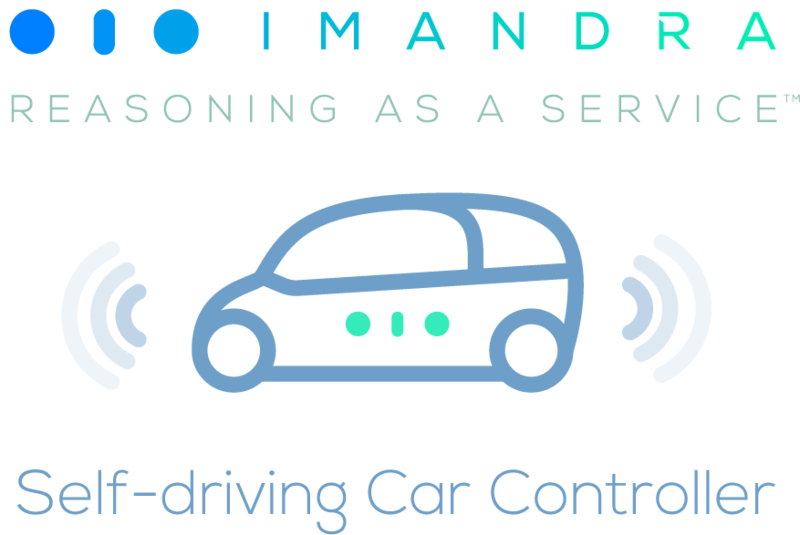 In this notebook, we'll design and verify a simple autonomous vehicle controller in Imandra. The controller we analyse is due to Boyer, Green and Moore, and is described and analysed in their article The Use of a Formal Simulator to Verify a Simple Real Time Control Program. If the vehicle starts at the initial state (0,0,0), then the controller guarantees the vehicle never strays farther than 3 units from the x-axis. If the wind ever becomes constant for at least 4 sampling intervals, then the vehicle returns to the x-axis and stays there as long as the wind remains constant. These results formally prove that the simulated vehicle appropriately stays on course under each of the infinite number of possible wind histories. Quantities in the model are measured using integral units. The model is one-dimensional: it considers the y-components of both the vehicle and wind velocity. Wind speed is measured in terms of the number of units in the y-direction the wind would blow a passive vehicle in one sampling interval. From one sampling interval to the next, the wind speed can change by at most one unit in either direction. The wind is permitted to blow up to arbitrarily high velocities. At each sampling interval, the controller may increment or decrement the y-component of its velocity. We let v be the accumulated speed in the y-direction measured as the number of units the vehicle would move in one sampling interval if there were no wind. We make no assumption limiting how fast v may be changed by the control program. We permit v to become arbitrary large. Given a wind-speed delta sensor reading and a current state, next_state computes the next state of the system as dictated by our controller. The behaviour of the wind over n sampling intervals is represented as a sequence of length n. Each element of the sequence is either -1, 0, or 1 indicating how the wind changed between sampling intervals. We define the predicate arbitrary_delta_ws to describe valid sequences of wind sensor readings. We now define the final_state function which takes a description of an arbitrary wind sampling history and an initial state, and computes the result of running the controller (i.e., simulating the vehicle) as it responds to the changes in wind. We now partition our state-space into a collection of regions, some "good," most "bad," and show that if we start in a "good" state (like (0,0,0)), then we'll (inductively) always end up in a "good" state. We prove: If we start in a good state and evolve the system responding to one sensor reading, we end up in a good state. We prove: If we start in a good state and simulate the controller w.r.t. an arbitrary sequence of sensor readings, then we still end up in a good state. good_state s && arbitrary_delta_ws dws ==> good_state (final_state s dws). We shall induct according to a scheme derived from final_state. But simplification reduces this to true, using the definition of final_state. List.for_all and final_state, and the rewrite rule safety_1. We prove: No matter how the wind behaves, if the vehicle starts at the initial state (0,0,0), then the controller guarantees the vehicle never strays farther than 3 units from the x-axis. We prove: If the wind ever becomes constant for at least 4 sampling intervals, then the vehicle returns to the x-axis and stays there as long as the wind remains constant. ==> let (s' : state) = final_state s dws in s'.y = 0. && (not (dws2 = ) && φ (List.tl dws2) s ==> φ dws2 s). But simplification reduces this to true. But we verify Subgoal 1'''''.1.2 by recursive unrolling. But we verify Subgoal 1'''''.1.1' by recursive unrolling. You may enjoy reading the above proof! Now, we prove the final part of our main safety theorem. Now that we've verified the controller, let us imagine instead that we'd made a mistake in its design and use Imandra to find such a mistake. For example, what if we'd defined the controller as follows? Error: vehicle_stays_within_3_units_of_course is not a theorem. Imandra shows us that with our flawed controller, this conjecture is not true! In fact, Imandra computes a counterexample consisting of a sequence of three 1-valued wind speed sensor readings.